Gift baskets are extremely easy to put together, but if you are creative enough, the results will look stunning. Gift baskets are suitable for people who cannot decide on one particular gift items, so they prefer giving away and assortment of goods all wrapped up (or in this case, placed) in a nice package. Target corporate clients and earn by volume. Start-up capital is P1,000 per basket, not including items to be placed inside. Time to finish is less than 15 minutes. When buying ready-made bows, make sure the size is right for your basket–for example, don’t hide a small basket with an over-sized bows. 1. Decide what the basket “theme” will be first — is it for Christmas presents? Mother’s Day? Birthday? Your decorations will revolve around that theme. For this project, we are making a Christmas-theme. For this project, we are making a Christmas-themed basket. 2. Place the gift items in the basket starting with the tallest items toward the back, forming a “wall”. Place medium-size items in front of the “wall” (so that they are leaning against it); the smallest items will fit along the front rim of the basket. 3. Wrap a colorful ribbon around the handle of the basket. 4. Fill in the other blank spaces of the basket with Christmas flowers and other holiday trimmings. 5. Using the same ribbon, make a bow. Measure 8 inches from the end of the ribbon and pinch the spot firmly between your thumb and index finger. Make a loop and pinch tightly, then make a second loop and pinch over the first two pinches. Repeat this process, forming as many loops as you want. Pinch and tile all the loops together with tape or wire. Trim off the excess, and glue this bow to the front of the basket. 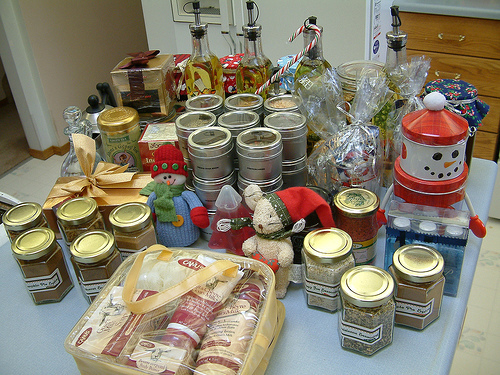 Your production cost will vary depending on the amount of the items inside the gift basket. However, a safe bet would be to put a markup of 20% on the final price.